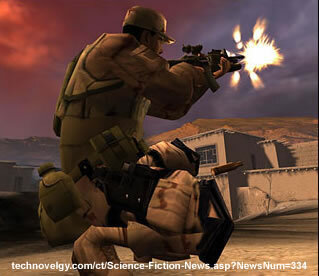 America's Army, the official U.S. Army game, is an online video game that has registered about 4.7 million users. More than 30,000 people log onto the game's servers every day; thousands more play in unofficial leagues. It claims to present the most authentic military experience available, including individual and collective training. Greetings Starfighter. You have been recruited by the Star League to defend the frontier from Xur and the KO-Dan Armada. 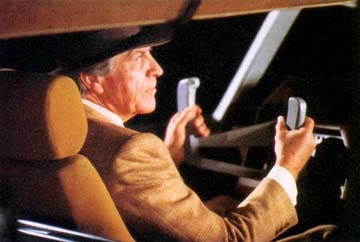 No wait - that's the start of the video game in the movie The Last Starfighter, a popular 1984 sci-fi thriller, in which a video game is used to both train and find the best Starfighters - for real. Whenever a player on Earth won the game, he was abducted by Robert Preston - or rather, Centauri - to fight the real bad guys out in the galaxy. The Army spares no expense in making the game realistic; uniforms, equipment and situations are made as similar to the real thing as possible. The software has a Teen rating; death animations are without gratuitous gore. Special Forces soldiers wear motion capture suits to record urban assault techniques. 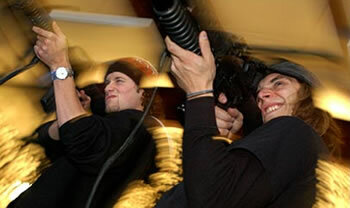 Game programmers spend time under the targets at a firing range, to make sure that the noise used in the game realistically simulates the "crack" of the miniature sonic boom made by a passing military round. In the movie, the Last Starfighter video game is placed all around America; wherever kids are bored, they can always play video games. (Historical sidenote: this movie was made before the era of handheld games. If you wanted to play a video game, you had to go to an arcade to play at a large, cabinet-sized machine.) Young Alex, who lives in a trailer park, wins the game and is recruited to join the Starfighters. In real life, America's Army is as close as your Internet-enabled computer, and most Army recruiters have copies of the game and offices in malls. "We don't expect that a young person is going to play the game and run out and join the Army," Chris Chambers, retired Army major and project deputy director, said. "That was never the point. We want the game to help us form a more long-term connection with the young person." Read more about how America's Army is made more realistic; visit the America's Army website. 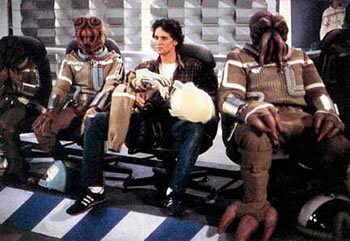 Read more about The Last Starfighter.